Established in 1980 and with continually improved facilities this site attained Gold Award status at the inception of CaSSOA. There is a warden permanently on site and the proprietors residence is close by. The site complies with all current safety requirements and will continue to upgrade as circumstances dictate. 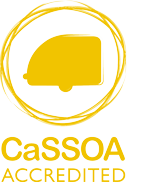 CaSSOA approved storage sites are more secure. Therefore CaSSOA approved storage sites help to reduce crime. To reassure caravan owner's they can be confident that every CaSSOA site has taken reasonable measures to protect the stored caravans. Darwen is accessed off J4 of the M65 From Darwen, towards Bolton on the A666 to Bull Hill, then take 1st entrance on the left after Grainings Wood into Hall Moss Business Park. The site entrance is 250m up on the hill over the speed bumps.